Police have restored order after rioting broke out at an Australian-run immigration detention camp on the Pacific island state of Nauru. Reports said several buildings were set alight on Friday and the camp's medical centre had been destroyed. Australian immigration officials said about 150 asylum-seekers were involved. The riot broke out hours after Australian Prime Minister Kevin Rudd announced tough new measures on asylum-seekers arriving by boat. Witnesses said a large number of local residents carrying machetes and steel pipes arrived to help police in preventing the asylum-seekers - most of whom are believed to be Iranian - from breaking out. Australian broadcaster ABC, citing an unnamed security guard at the camp, said refugees began rioting on Friday afternoon and within two hours had overrun the centre. Many had armed themselves with knives taken from the kitchen, the report said. At least four inmates and several guards were said to have been injured. Local photographer Clint Deidenang said that a four-hour protest at the centre was abandoned when a large number of local residents arrived to help authorities contain the violence. Australia's immigration department confirmed there had been "non-compliant behaviour" at the facility but that the centre "is actually now calm". "We are still assessing the extent of the damage, all we know is that there is damage to property," a spokeswoman told AFP news agency. She said that some detainees had escaped during the trouble but that all had now been accounted for. Mr Rudd has said they will no longer be resettled in Australia but will go to Papua New Guinea. He said the move was in part aimed at dissuading people from making the dangerous journey to Australia by boat. He was setting out an overhaul of asylum policy ahead of a general election expected shortly. 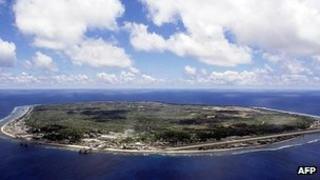 Will Nauru camp deliver solution? Is U-turn a 'better option'?